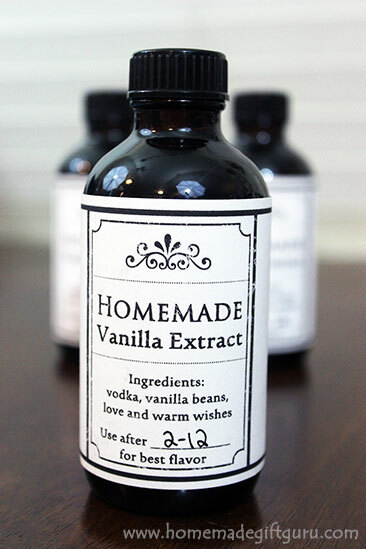 Homemade vanilla extract makes great homemade gifts for pretty much anyone with a kitchen. In fact, it's been one of my favorite, most versatile homemade gift ideas yet. Vanilla makes a perfect homemade gift idea for Christmas or a super SWEET hostess gift idea for Thanksgiving and other cool weather get-togethers. 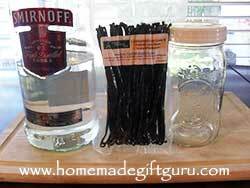 I've even given homemade vanilla extract for a wedding gift, along with an item from their gift registry. I felt it added a personal touch of warmth (and helped make a smaller gift choice feel more substantial). All you really need to make your own vanilla is good quality vanilla beans, vodka and patience. 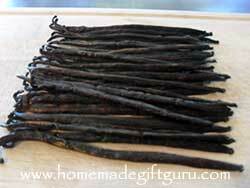 While fresh vanilla beans are one of the great pleasures of life, vanilla beans get stale fast. This is one reason I like to make a bunch of vanilla at once. 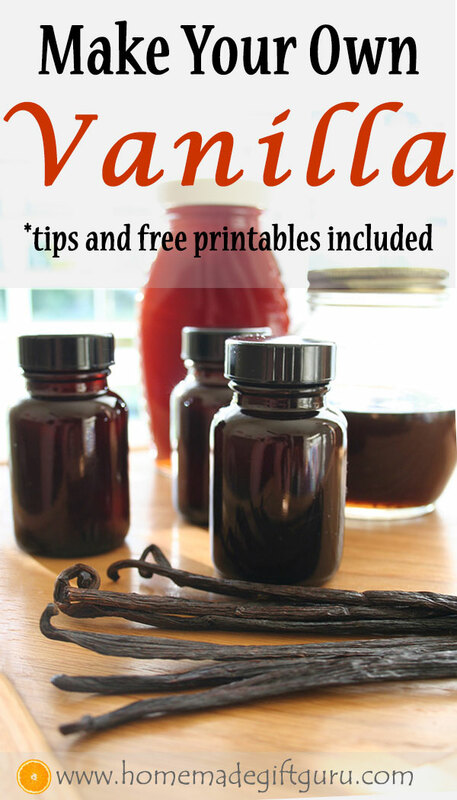 If you order them in bulk, you can make enough pure homemade vanilla extract to last you all year long AND have several bottles for homemade gifts. Win! Below, I've put together what I hope is all the information you could possible use on making vanilla extract and giving it for gifts. Not quite ready to make vanilla? Pin it for later! I order my vanilla beans once a year, ordering enough to make vanilla extract for the whole year, along with several bottles for gift giving. 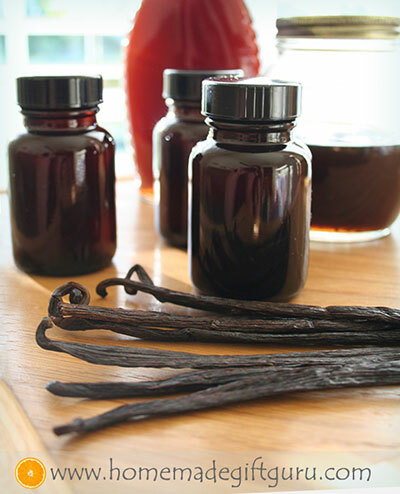 Ordering vanilla beans online is by far the best deal and I recently learned that the less expensive Grade B vanilla beans are actually preferred for making extract with. Apparently, the fact that they are less moist and sticky than the Grade A vanilla beans is actually a good thing in this case... because it means they have less water and more concentrated oils in them. This is also true when putting vanilla beans in your homemade Kahlua to create a stronger vanilla flavor that deepens with age. Here's a couple free printable gift tags you can use. Just click on the link or image or pin them for later! Tip: Print on card stock and mount on a backing that is trimmed slightly larger than the tag. 1. Chop Vanilla Beans. 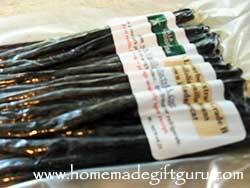 When you get your vanilla beans in the mail, leave them vacuumed packed. If you open them and can't make vanilla right away, it's best to triple wrap them and use them as soon as you can. Always store in a cool dark place but do not refrigerate as this can dry them out. 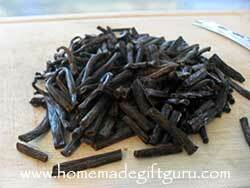 To make vanilla extract with your fresh vanilla beans, open your vanilla beans and lay them on the cutting board. Chop them or snip them into 1/2 inch pieces. You can slice them down the middle but it is time consuming and unnecessary. 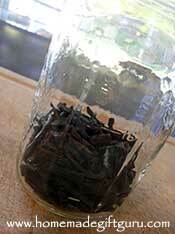 Note: If you're curious, my 1/4 lb package contained 42 vanilla beans, which loosely filled up about 1 cup of the jar. 2. Fill Jar. Put the chopped vanilla beans into the mason jar. Fill with vodka. Put the lid on and tighten it using a canning lid band. 3. Shake Jar. Shake the jar today, tomorrow and whenever you can for the next four weeks or more. Store in a cool dark place - emphasis on dark. Extreme temperatures and exposure to light will have an adverse effect on taste. 4. Wait 4 or More Weeks. Besides an occasional shake, you can now take a break! You've got your vanilla beans safely tucked away, hooray for you! And your Christmas gifts are all lined up too... how cool is that! 5. Strain and Bottle. When it's been 4 weeks or more (I often let mine infuse for months because I love the intense flavor it provides), you have the option to strain the vanilla beans out. You don't have to strain them out, but if you are making gifts with your vanilla, you may want to strain your vanilla and put it in pretty bottles. 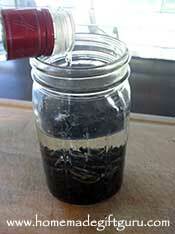 Your homemade vanilla extract should be nice and dark and fragrant. Test it, what do you think? You can let it sit longer if needed. If it's yours, just leave it be... the scent of vanilla will keep getting stronger and deeper as it ages. If you are ready to turn these into lovely gifts, you can strain out the beans and the bits and bottle your homemade gifts now. 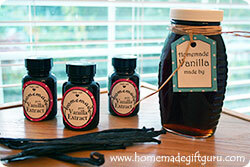 Learn how to make everlasting vanilla extract right in the jar, for gifts that keep giving! Tip: Even after you've strained and bottled your vanilla extract, you have the option of putting a vanilla bean inside each jar. Though it's not necessary, the advantage to doing this, is that your homemade vanilla extract will get stronger and stronger, the longer it sits with vanilla beans in it. Minus?... your vanilla extract will have seeds and bits from the bean. Some people like this, some are more finicky about such things. Homemade vanilla gifts are made with love and warm wishes (get the free printable gift tags that say it!). Not Sure Which Vanilla Beans to Use? I use the full flavored sweet tasting Bourbon Madagascar vanilla bean for my food gifts, however, you can also use Mexican. I use Tahitian for bath and body (Tahitian is more of an aromatic vanilla bean and can be described as slightly floral in aroma). 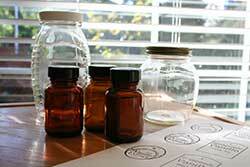 How long does it take to complete homemade vanilla extract? 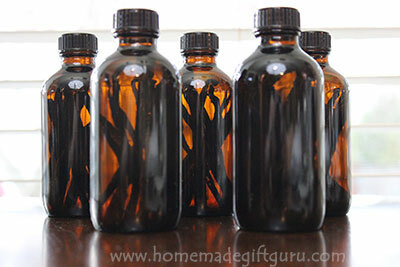 It's important to mention that your homemade vanilla extract will take at least 4 weeks to infuse. You only need a few minutes to get it going but you'll want to plan ahead. The more you shake it, the quicker it will infuse. I personally like mine best after a few months of infusing, but I tend to forget to shake it, so that may be why. What is the shelf life for pure vanilla extract? The shelf life of vanilla is explained well here. It should last indefinitely with proper storage. What is everlasting vanilla extract? Everlasting vanilla extract is what you get when you leave the vanilla beans in the jar, and every once in a while, as you use your extract, you top off the jar with fresh vodka. It's best to use a few extra vanilla beans for richest flavor. 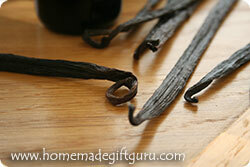 The vanilla beans can continue to make the extract stronger and richer for a long long time. Preserved Vanilla Beans in Pure Vanilla. Another cool trick is to pack a jar full of whole vanilla beans, that's right no snipping the ends... then completely cover them in Vodka (don't let any beans stick out the top!). Now the really cool part... when you need vanilla extract, use it from the jar and top back off with fresh vodka, to keep the beans submerged. It can last basically forever. As a bonus, when you need a vanilla bean for a recipe, simply remove a bean from the jar (using some sort of clean instrument, like a fork), snip off the end and squeeze the insides right into your dish or your whipped cream for example. If you do this part a lot, you'll have to replenish the beans from time to time too. 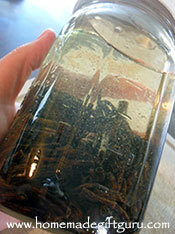 This makes a fantastic everlasting vanilla extract plus lots of preserved vanilla beans for your recipes. Although you can bottle homemade vanilla extract in the pretty bottles of your choice, it is sensitive to light... so it's always best to put vanilla bean extract in a dark bottle. I save bottles all year for my projects, so of course the little brown bottles shown above are re-purposed (I saved them from a supplement I use from my local health co-op). Did you remember to print labels? 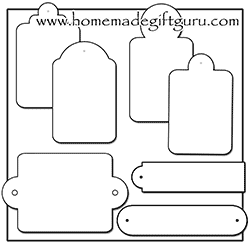 If you haven't already done so, feel free to print some of the vanilla gift tags and/or vanilla labels, linked to under the supplies section above... or you may choose to make your own tags and labels. Either way, I'm sure your homemade vanilla gifts will be SWEET and well received! 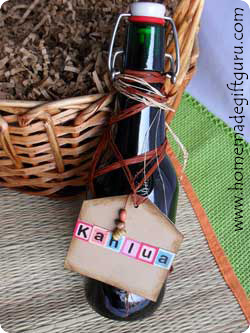 Homemade Kahlua Gifts are So Yummy!